Ocean view and city lights in Old Monterey Bay. Walk to downtown and Fishermans' Wharf. Our home is beautifully furnished with new hardwood floors throughout, many antiques, original art and Persian rug. It is a fully equipped home with everything you need. Its' perfect for a relaxing vacation, writer's haven or a temporary work assignment. Two master bedrooms offer you comfort and individual privacy. Included is a garage, washer, dryer and private backyard. This home is bright, light and cheery! 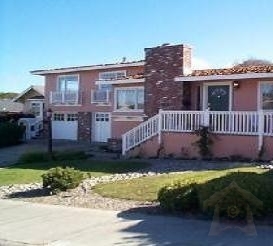 Located in the sun belt of Monterey our home has nicely manicured yards and a quiet neighborhood. The perfect place to enjoy the best of Monterey, better than a bed and breakfast. BR B Amenities: /B BR Our home has TV, VCR, DVD, stereo, dishwasher, disposal, spacious kitchen, fax machine, internet access, washer, dryer, gas log fireplace in brick with a raised hearth, hardwood floors, comfortable furnishings, bike, beach chairs and umbrella, patio furniture, two chaise lounges and a BBQ. BR B Activities: /B BR Walking in Monterey is delightful whether it is to Downtown for the Tuesday Farmers Market, movies, dining, shopping or to Fishermans' Wharf. Be sure to visit Monterey Bay Aquarium and Cannery Row as well. As you stroll from the Aquarium to Lovers' point along the rugged Pacific Ocean coast you will pass the wonderful old Victorians facing the sea. BR B Area: /B BR If you like to walk, nearly everything is within your range. Bikers have miles and miles of sea coast to enjoy. $569 deposit, credit cards accepted. Balance due 30 days before arrival by check or e check.